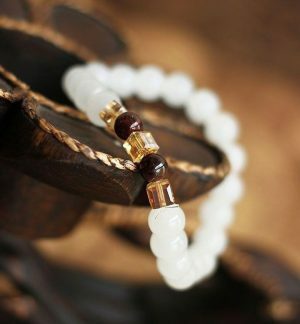 Essential oil bracelets are more than just a piece of jewelry, they are said to have healing and spiritual properties. 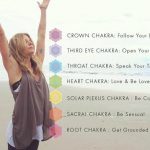 For many yogis, diffuser bracelets offer a unique privilege and show off their style. 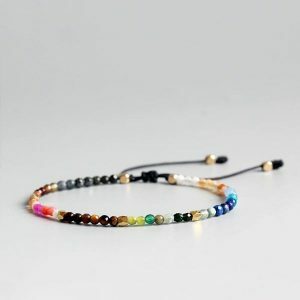 Chakra bracelets are Not only limited to their amazing beauty, but they are also believed to enhance chakras and the positive energy in the human body. Hence to stay on top of physical and mental health you most certainly need one of these. 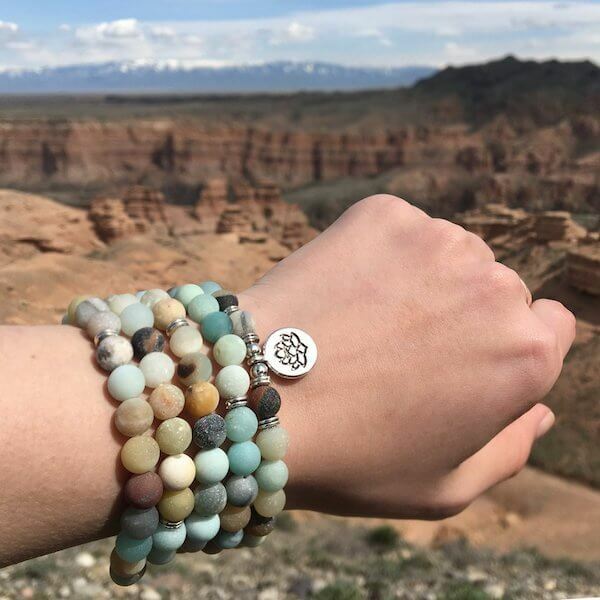 This diffuser bracelet will bring you beauty, calm, humility, fulfillment, a loving demeanor, piety, perfection, sincerity, spiritual balance, wisdom, and tranquility. 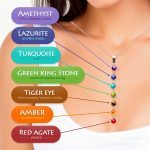 The seven chakras in the human body are represented by colorful natural beads. The Aum Charm representing the Turiya also reminds you to relax and take a break to achieve infinite consciousness. 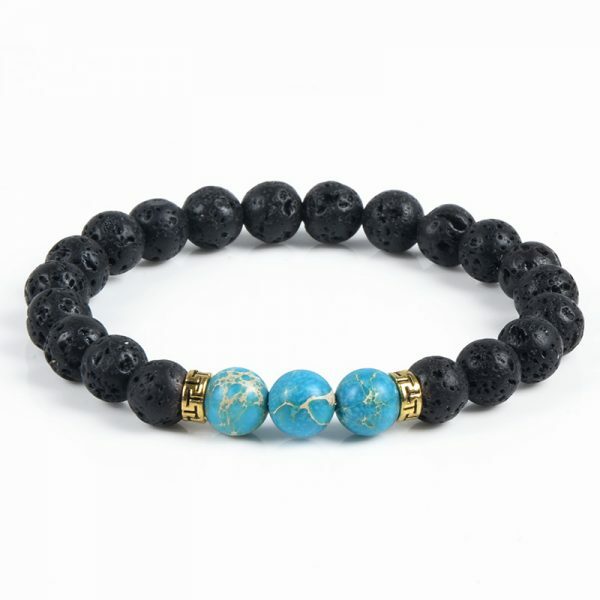 The natural turquoise stone of this lava stone diffuser bracelet has both physical and emotional healing energy. it is also used as a stone of spiritual purification to dispel negativity and bad energy from the living space. Used by many people use, White Howlite has calming virtues that help to relieve anxiety and stress of all kinds. 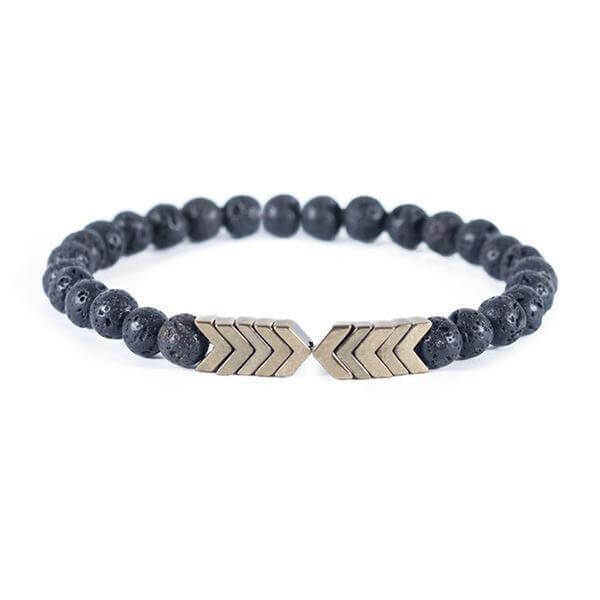 The Lava rock has a certain subtle appeal to it and its use on this bracelet. The rocks are mounted on a sturdy plastic stretch cord. 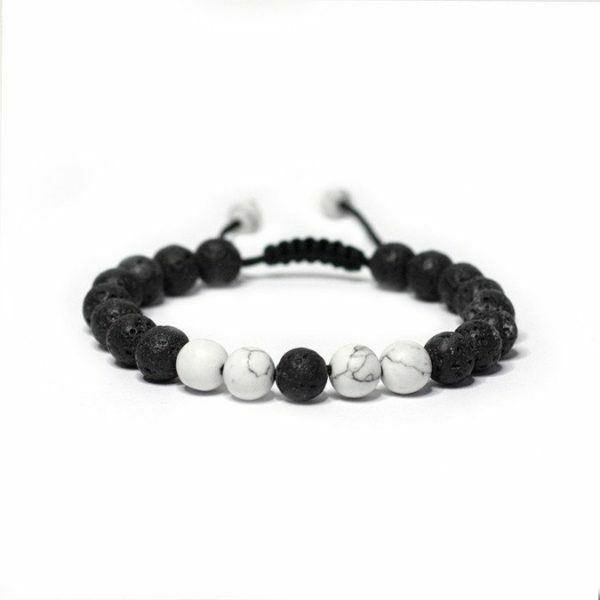 Very popular and stylish howlite and Lava Stones Diffuser Bracelet with Adjustable cord, the howlite stone helps relieve stress and sleep. 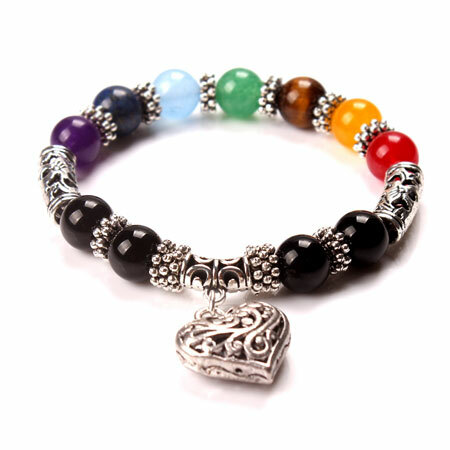 This stunning yoga style gemstone beaded bracelet features 7 sphere gemstones with a heart charm. 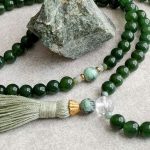 Gemstones are believed to provide healing qualities when used for intent or during meditation. 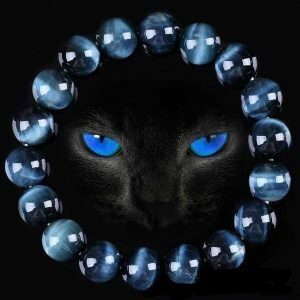 The shape of a sphere allows the gemstones energy to flow freely and evenly in all directions from within its center. 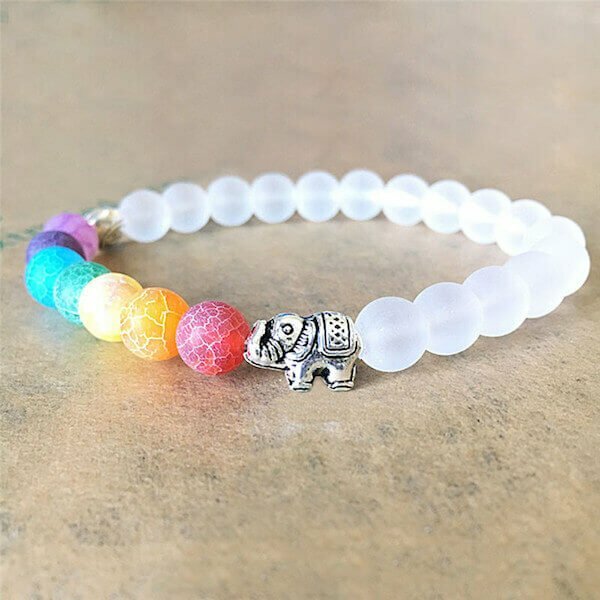 Beautiful chakra bracelet with elephant pendant. 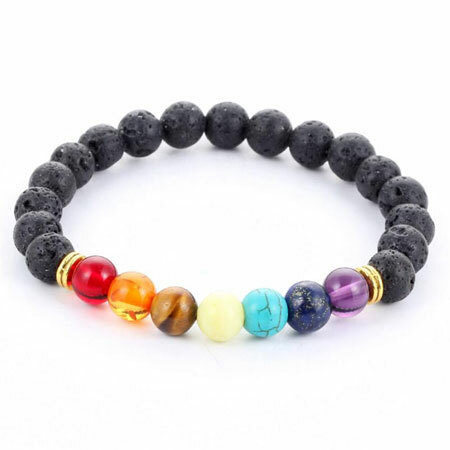 Each stone in this bracelet resonates with its own energy with a healing frequency to calm any agitation and anxiety in your thoughts and spirit. 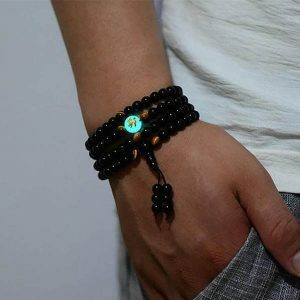 Wearing this Agate Stones Lion Eye Mala Energy Beads bracelet has numerous benefits: Increase Energy, Increase Self Confidence, Become More Decisive, Sharpens Your Senses. 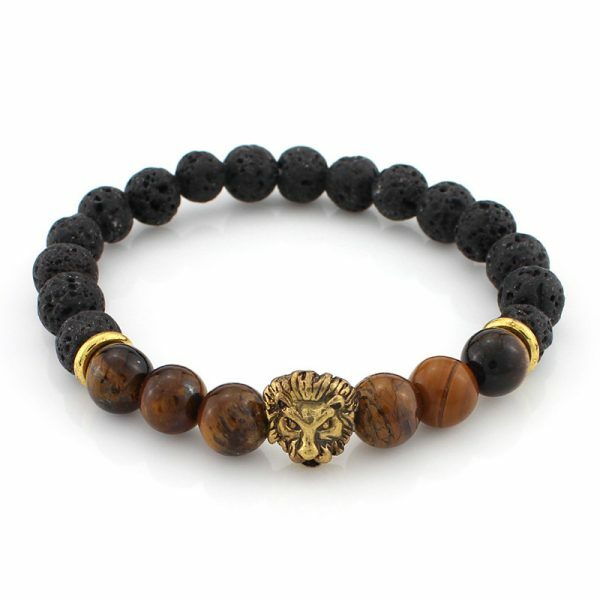 Bring good vibes with this beautiful Lava Stone and Imperial Jasper bead bracelet. 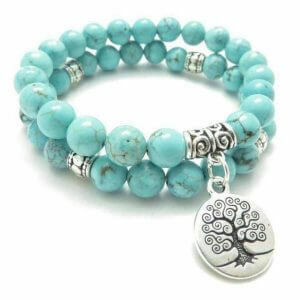 This amazonite mala bracelet with lotus pendant is a wonderful representation of the blossoming of being. It can be worn as a necklace or wrap it around your wrist multiple times to wear as a bracelet. 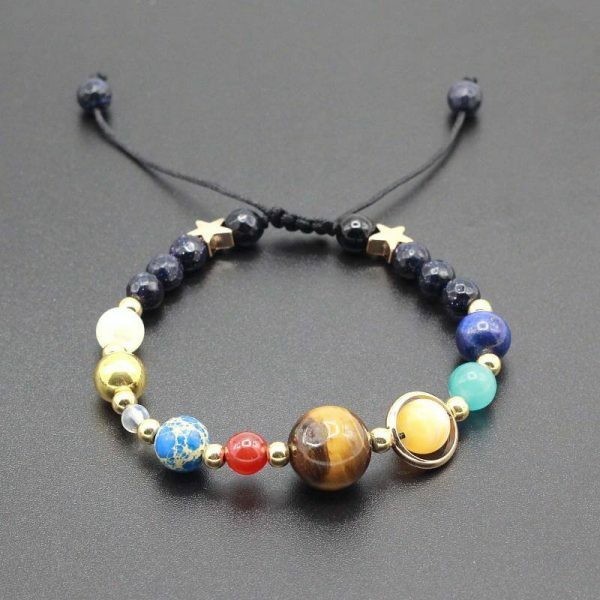 Wear a mini-version of the entire solar system on your wrist. This is Our first and ever astronomical solar system bracelet that directly reflects the intertwined human nature and the universe. Whether you’re buying this for yourself or as a gift, we promise that this bracelet will both feel and look amazing. Available in 5 designs. Diffuser Bracelet lets you take the scent of your favorite essential oils with you everywhere you go. 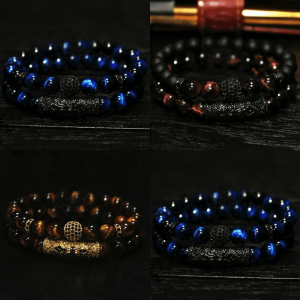 Different bracelets variations exist today with different needs and styles. However, no matter the type of essential oil bracelet that you prefer, all of them work the same. An essential oil diffuser bracelet is a mobile and a trendy way of enjoying certain aromatherapy throughout the day. The essential oils are mostly used for mood and health changing properties. 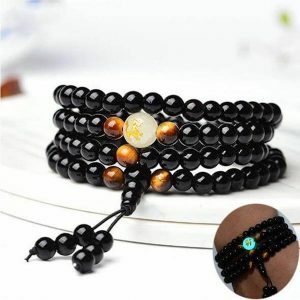 Many people don’t know how to use essential oil bracelets even though most people desire them. Using essential oil bracelets is quite easy. 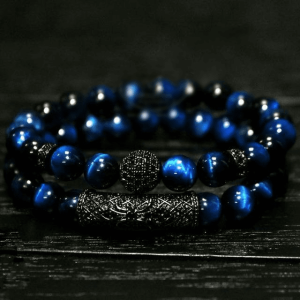 To begin with, a person needs to use a drop of their preferred oil and rub them on the black lava beads. The simplest way of using this oil is to put a drop on your finger first then rub it on the black lava beads. Other than that, a person can also apply the essential oil straight from a roller bottle and run the bottle over the diffuser bracelet lava seeds. It is important to note that the essential oils need to be diluted before using it on the skin. Essential oils vary in quality depending on the brand used. Some brands are less pure than others. It is always advisable not to use poor quality oil because it can cause a reaction with the skin. Therapeutic grade essential oils are suitable for applying on lava beads. It is possible to match different oils to create a unique favorite combination. 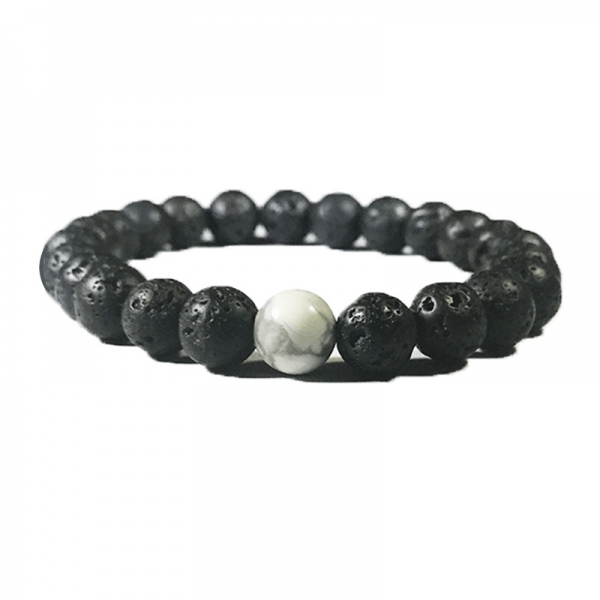 Lava rocks are the most suitable stones to use these in making an essential oil bracelet. First of all lava rocks come in several beautiful colors making them highly attractive and they are also readily available. 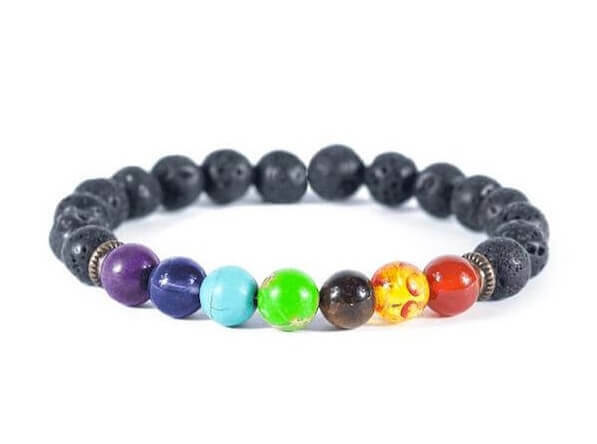 Secondly, these rocks are the best aromatherapy bracelets diffusers since they are porous and capable of holding the scent of the applied oil for many days to come. There is no right or wrong oil to apply on lava beads. Relaxing oils are good for giving a relaxing mood and relieving stress. Citrus oils are and peppermint is good for a quick boost of energy. However, citrus oils can cause photosensitivity so it will be advisable to avoid direct sunlight when using these types of oil on the skin. There is compelling evidence proving that inhaling the aroma of essential oil is effective for calming nervous or anxious emotions in different settings. The close connection between a person’s emotions and aroma is evident in our everyday life as certain aromas trigger various feelings. 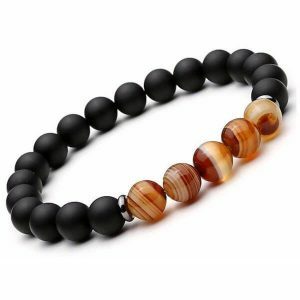 Essential oil bracelets create a satisfying feeling around the user as they help regulate emotions and help an individual throughout the day. 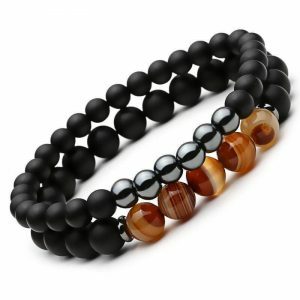 These best diffuser bracelets are preferred by couples as it gives them a mutual feeling even if they are far apart. Using the oils can be a bit challenging but with enough practicing an individual’s will probably get it right. Essential oils give couple bracelets meaning. 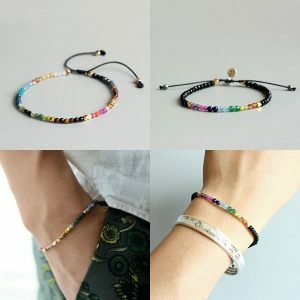 Essential Oil Bracelets give their wearers the chance to showcase their fashion style, and enjoying the virtues of Essential Oil at the same time. Take action and get the huge advantage of possibilities that they offer by making a pick from the above-selected list of amazing options..